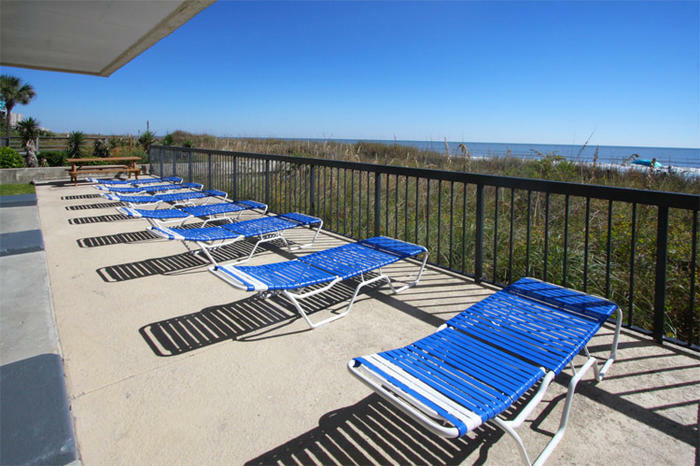 There is so much to love about a North Myrtle Beach vacation where you can see the oceanfront from your private balcony and hear the waves rush ashore from the oceanfront sun deck of your North Myrtle Beach resort. Knowing that all the terrific North Myrtle Beach attractions are minutes away from your comfortable accommodations makes your North Myrtle Beach vacation even better. Crescent Towers I is an oceanfront North Myrtle Beach resort. It features North Myrtle Beach vacation rentals that each has a private oceanfront balcony. The sun deck at Crescent Towers I is on the oceanfront and from it you can definitely hear the crashing waves of the Atlantic Ocean. And all the most memorable attractions found in the Myrtle Beach area are just around the corner from this North Myrtle Beach resort. Everything about this North Myrtle Beach resort is pointing to a wonderful North Myrtle Beach vacation. You will find Crescent Towers I in the Crescent Beach section of North Myrtle Beach, South Carolina. It is a North Myrtle Beach resort that is just south of the Ocean Drive section of town where beach clubs feature shag dancing to live beach music. And it is right near Barefoot Landing where you will find shopping, dining, Alabama Theatre, House of Blues and more. You simply can’t beat the oceanfront location of this North Myrtle Beach resort. This North Myrtle Beach resort has nine floors of North Myrtle Beach condominiums and only four North Myrtle Beach vacation rentals per floor. It is a terrific size that is not too big and not too little. An elevator and stairs are located in the middle of the hallway at this North Myrtle Beach resort and on the ground level there is some covered parking available so you can be in and out of your car and up into your North Myrtle Beach rental in no time when you vacation at Crescent Towers I. The sparkling blue swimming pool at Crescent Towers I is located on the street side of this North Myrtle Beach resort. It is fenced in and from this swimming pool you can see the Atlantic Ocean through a nearby palm tree landscape. There are lounge chairs around this sparkling blue swimming pool and stretching out on one of these comfortable seats will likely sound like a good idea when the sun is shining. Choose one of the two-bedroom North Myrtle Beach condo rentals to be your North Myrtle Beach vacation destination. They are all on the oceanfront with a private balcony that boasts direct oceanfront views. All of these North Myrtle Beach rentals have a nicely furnished kitchen with full-size appliances. Take advantage of all of the amenities featured in these North Myrtle Beach vacation rentals, such as the dishwasher, washing machine, clothes dryer and DVD player. These condos in North Myrtle Beach, South Carolina are well equipped with all of the things you most want during your family beach vacation in North Myrtle Beach, South Carolina.